A young woman was stabbed from behind by the man she had refused to wed in an arranged marriage, a court has heard. Darshana Narotam, 18, of Wembley, London wrestled the knife from her attacker as he stabbed her and her boyfriend, in Spinney Hill, Leicester, the jury was told. 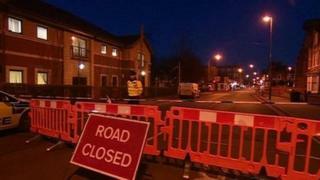 At Leicester Crown Court, Bharat Soma, 26, of North Evington, Leicester denies two charges of attempted murder. Ms Narotam's parents deny charges of assault and false imprisonment. The two victims were injured on 19 January on East Park Road in Leicester, but recovered after treatment in hospital. The court heard Ms Narotam had run away from home with boyfriend Prashant Govinde, 23, because she was opposed to her parents' plan for an arranged marriage. Ms Narotam's family is originally from Dui, a small island off the west coast of India and a former Portuguese colony. Her parents did not approve of her relationship with Mr Govinde, who was slashed in the face and stabbed in the neck during the attack. Prosecutor Adrienne Lucking said: "Despite her injuries, she managed to prise the knife from Soma's hand and throw it aside. "She was screaming for help. Soma tried to kill them both because they had, in his eyes, dishonoured him." The court heard Ms Narotam was also locked in her bedroom by her parents over a period of several months. Her father Narotam Deugi, 41, and her mother Parvati Natu, 42, of Wembley, both deny charges of common assault and false imprisonment. Four other people deny charges related to the kidnapping of Mr Govinde's father, Govinde Ramji, in an attempt to find out the couple's whereabouts. A teenage boy who was with the couple was also injured in the attack.